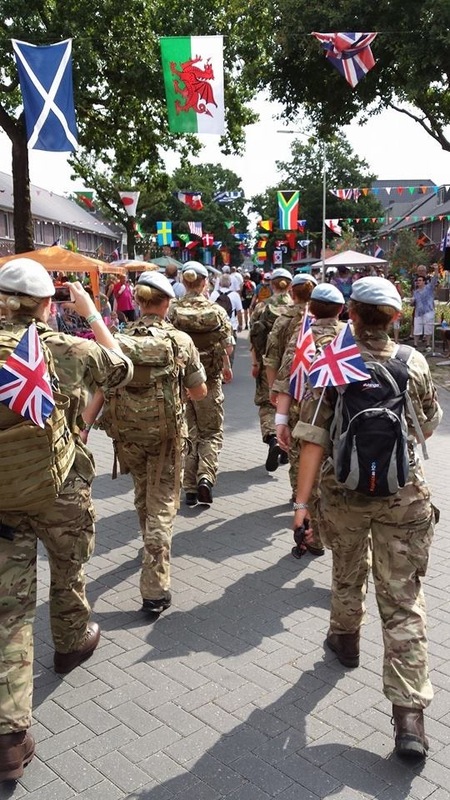 Staff Sergeant Michelle Carr, Army Air Corps (AAC), shares the experiences of her all-female team, as they take part in the Nijmegen Marches (12 – 19 Jul 14). 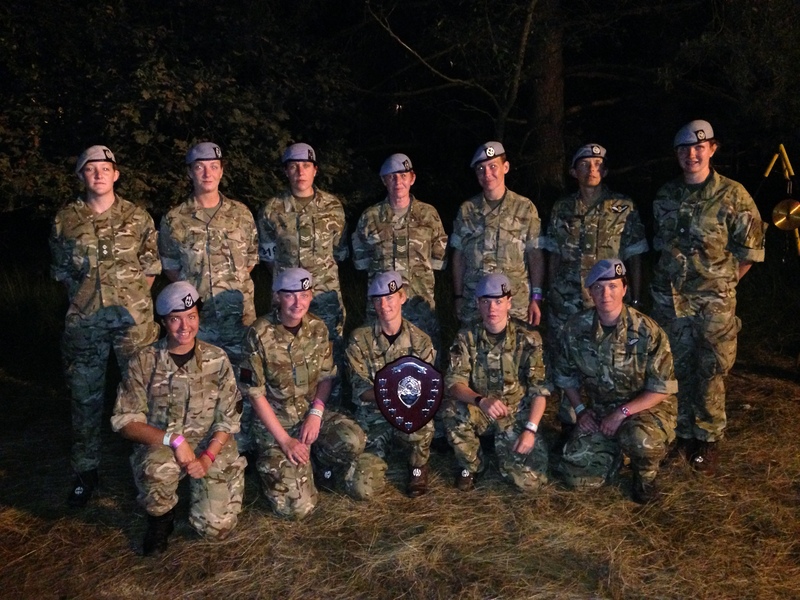 The mixed-ranks team won the Best Land Team prize, based on speed, team spirit, morale and general conduct throughout the event. Having successfully qualified at the RAF Cosford 50-mile test eight weeks before and being awarded 2nd best Army team, we were looking forward to the challenge, albeit a little apprehensively. The march consisted of approximately 46,000 participants, 806 of whom were British military and 369 from the Army (including a team from 9 Regt AAC). 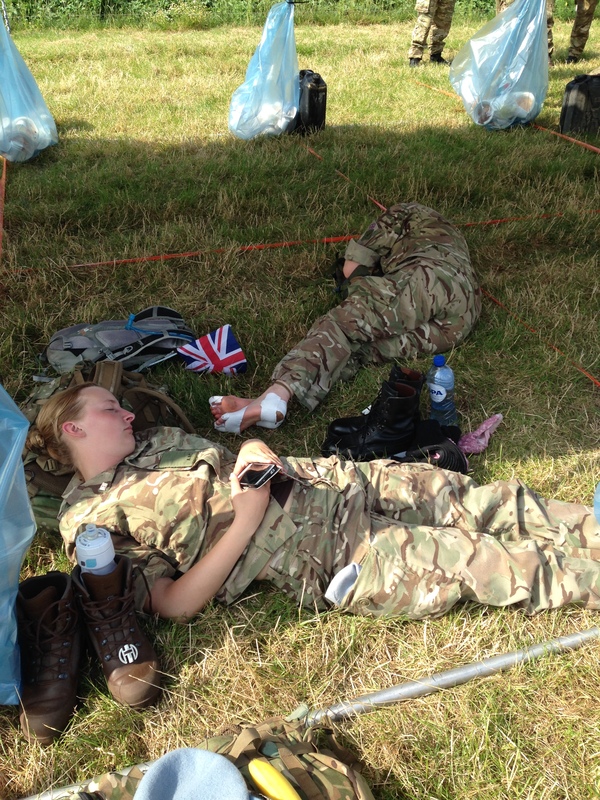 Each day teams must cover a set distance within a certain time frame, with two or three designated rest stop areas which had refreshments and medical cover. An early start of 0405 hrs wasn’t as bad as we first thought as the atmosphere was amazing from the beginning . It was a tough day as we had 29 miles to tackle but fresh legs and tip-top morale meant the day went as smoothly as can be expected and we finished with a full team and no serious injuries. Blisters and sore feet were here to stay! Along the route we came across a Reservist who had completed the march 39 times and was part of the support team. I asked him for some tips; the advice was to get around as quickly as possible and spend the minimal amount of time in the rest areas (10 – 15 minutes). That is what we did. Another very early start but with less distance to cover; 23 miles. A lot of Ibuprofen and blister management was a theme! I have to admit that the team were making my job as team leader very easy; self motivation and determination (or stubbornness) was an attribute of each team member. Towards the 18-mile point it was apparent that the team were feeling the miles they had covered and needed a pick-me-up. We came across a German Team as we entered back in to Nijmegen town and we sang songs to each other back and forth for the rest of the distance (it’s amazing how singing helps, it speeds up the pace and takes your mind off the pain). Once again we finished with a full team. It was hinted to me that we were in the running for best Land team (this category was for British Army and the Royal Navy). A slightly later start and a slight hiccup from one of the team meant that we missed our start time. This resulted in us being the VERY last team to leave camp. As we had messed up a little I assumed that the best team prize was out of the window; however, we still felt like we had to make amends, so we really went for it. Ten minutes in each rest stop (as opposed to some teams spending 45–60 minutes) and a quick pace meant that we lost count of how many teams we over-took, and morale was through the roof. That evening at the Team Leaders brief we were awarded the best Land team prize for speed, Morale, team spirit and not to mention that we had still not lost anyone from the team. The final and longest day. We had 30 miles to get through having started with extremely sore feet/legs/backs; this was a huge challenge in 36-degree heat. It was made even more difficult due to the sombre mood because of the loss of many Dutch lives on the Malaysian Airlines flight the previous day. As it was the last day we knew the end was in sight so we kept to our strict timings but we did have to stop more often. At the end of the route despite the nation grieving the atmosphere was amazing and there were local people everywhere playing music and spraying us with water, which was appreciated by all of us. As the Team Leader the most worrying part of the whole March was the final four miles, this should have been the ultimate march through Nijmegen town centre but the lack of water, heat and sheer distance covered resulted in many service and Cadet personnel showing signs of heat injuries. Although morale was high our team members took it up on themselves to look after the wellbeing of others who were struggling (carry their own packs and individuals’ packs, supplying water and giving encouragement).